The new SOFIA observatory isn’t your average NASA project. 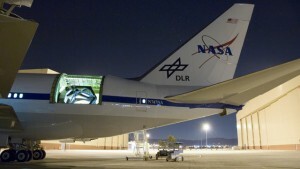 Engineers took a 30-year old 747 airplane, cut a hole in the side and installed a 17-ton telescope. Most telescopes are either on the ground or somewhere in orbit, but SOFIA falls somewhere in the middle, flying around at about 40,000 feet. I got the chance to hitch a ride on one of its recent research flights as the plane left Moffett Field at the NASA Ames Research Center. It’s definitely not the kind of flight where you get a bag of peanuts and movie. The researchers take advantage of the nighttime sky, so we left at dusk for 10-hour tour flying zigzags across the Pacific Ocean. Each leg of the journey is carefully calculated so the telescope can pinpoint a far away star. The plane interior is packed with computers and equipment. It also lacks insulation since much of it was removed to install the telescope, so it’s both cold and loud inside. At four in the morning, the astronomers are still hard at work. If they’re as tired as I am, they certainly aren’t showing it. And unlike the Hubble Space Telescope, this telescope lands everyday, which means the scientists can update and fix the equipment. “By the time you get a mission into orbit, the technology you’re using is relatively old. Here we can stay state of the art all the time,” says McLean. NASA began developing SOFIA in 1997 and almost cancelled the project at one point. It flew its first science mission in November 2010 and now costs about $80 million a year to operate. Inside NASA's SOFIA Observatory, somewhere over the Pacific Ocean. But there’s a problem. Astronomers can’t see what’s happening inside the clouds because, once again, they’re made of dust and it’s hard to see through. “We don’t mean dust bunnies, but we mean little, tiny little grains of solid material. Doesn’t matter how big a telescope you have, you can’t see inside it,” McLean says. That’s why SOFIA looks at a special kind of light called infrared light. If you look through a telescope on the ground, you’re looking at the visible light from space – the light our eyes can see. Infrared light is invisible to us, but it penetrates space dust, which means the telescope can see through the dust too. “You get to see what you can’t see with your eye. It’s like a window has been opened,” says McLean. They’re looking for exactly how stellar nurseries give birth to young stars. McLean says catching a star as it’s forming can reveal clues about how own solar system formed. But star birth isn’t the only thing these researchers want to see. They’re also looking at the way stars die. As the plane makes as sharp right turn, the telescope focuses on an object called NGC 7027. It’s a planetary nebula – also known as a dying star. McLean and his team are capturing an infrared image of the nebula, which is about 3,000 light years away. They can also see what it’s made of. “It has a distinctive shape. It’s oval. There’s a hole in the middle and that’s because it literally is a shell of gas that came off the star,” says McLean. 7027 is dying because the star has run out of fuel – the same fate that our sun will face in about five billion years. As it dies, the star casts off its outer layers, shedding huge amounts of material to form a cloud around it. But it’s not entirely a sad story. As sky begins to lighten, we descend towards the Dryden Aircraft Operations Facility in the Mojave Desert, where the plane is based. 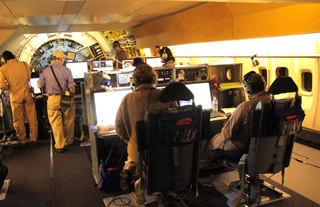 The SOFIA telescope is now undergoing service upgrades and then will return to the skies three times a week. Astronomers from around the world are lining up to get on board. Unfortunately, the article completely neglected the long history of airborne astronomy programs at NASA. This is even more remarkable since most of those programs were run out of NASA Ames at Moffett Field, where this SOFIA flight originated. In addition to the Lear, there was the Convair 990 “Galileo” observatory (tragically lost in a mid-air collision with a Navy P-3), and a C-141, the “Kuiper Airborne Observatory”, named after Gerard Kuiper, a prominent planetary astronomer who flew missions aboard the Galileo. We met briefly in 1987 when I interviewed with Jim Martin for the Flight Engineer’s position on the DC-8. I am still crewing the DC-8 out of Dryden and we are presently going on our 4th week down here in Punta Arenas, Chile on Operation Ice Bridge. The DC-8 is a remarkable platform that still has several decades of life left. My most treasured years in aviation were the years at Moffett Field crewing the DC-8, C130, and especially the C-141 Kuiper. SOFIA is absolutely gorgeous, but she still is unable to level off initially at 41,000 feet which is the desired altitude to get above most of the moistured air. We recommended over 20 years ago that GE Engines be installed for that needed thrust to 41,000 feet. The GE’s would pay for themselves many times over in fuel saved and added science. Sometimes you have to listen to the little people who knew better. Thanks for listening. I think you may be confusing me (Fred IV) with my father (Fred III). Punta Arenas. Wow. Of course, it’s Spring down there now – but is the weather there EVER good? I’ll mention you to my dad the next time I visit him. If you’re ever in the Bay Area, contact me at fred.drinkwater@gmail.com. The Ames flight ops folks have a monthly lunch, first tuesday each month, and I can sometimes get dad there. Very nice images and good explanations. Prev Our Corner of Cascadia Next Clean Car Diaries: Should Electric Car Drivers Be Taxed?